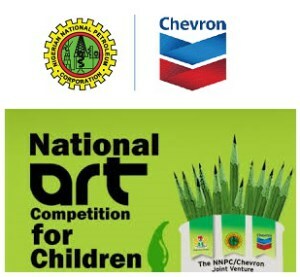 NNPC/Chevron Joint Venture in partnership with the Federal Ministry of Education is calling for applications from students in JSS1 – JSS 3 in Nigeria Secondary Schools for its 2018 National Art Competition. All works must be original and unaided. The National Art Competition is an annual arts competition with each edition driven by pertinent themes in line with current social issues. Policy, Government & Public Affairs, Chevron Nigeria Limited, 17, Hon Justice Mohammed, Bello Street, Asokoro, Abuja. Mrs. M.O. Onyegbu Federal Ministry of Education Federal Secretary Phase III, Room 8.08 (2nd floor), Abuja. Lagos State Policy, Government & Public Affairs, Chevron Nigeria Limited, 2, Chevron Drive, Lekki-Epe Expressway, Lekki, Pennisula, Lagos State. Policy, Government & Public Affairs, Chevron Nigeria Limited, Km 4 Warri New Port Expressway, P.M.B 1244, Warri, Delta State. Bayelsa Chevron Liaison Office, Major Oputa Street, By Chief Amange Street, GRA, Yenagoa, Bayelsa State. Participants are advised to adhere strictly to the theme and rules of the competition. Application Deadline is 30th July, 2018.